What is Corned Beef and Is It Healthy? When you think of St. Patrick’s Day what foods come to mind? Irish potatoes, soda bread, and corned beef are just a few of the traditional favorites that are enjoyed at this time of year. Though our prideful Irish friends are familiar with these dishes, the rest of us might wonder how to prepare them, how to best enjoy them, and perhaps, how they rate nutritionally. 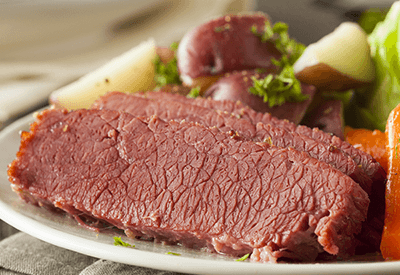 Corned Beef is a St. Patrick’s Day staple; “corning” is a method similar to curing. Adding spices and salt helps prevent spoilage while creating an intensely delicious flavor profile; hence, its frequent cameos in sandwiches, as brisket, even as breakfast hash! Like any red meat, choose a leaner cut and trim the fat to reduce its fat content. Reduce the sodium by preparing your corned beef from scratch! Prepare brine for beef brisket. Combine water, kosher salt, pickling spices, vinegar, and natural brown sugar or honey in a large saucepan. Bring to a boil, then allow to cool. In a deep pan, submerge the meat in the brine, cover, and marinate in the refrigerator for at least four to six days. Remove brisket from the marinade, rinse off added spices and salts from the brine, and cook corned beef as you normally would. Slow, moist cooking methods, like braising, are recommended for a tender and juicy texture. In a bowl, stir soft margarine and parsley together. Coat brisket thoroughly with herb butter. Place in a baking dish, cover and refrigerate over night. Prepare to cook brisket by heating oil in a large Crock-pot over medium-low heat. Add onions and cook, stirring occasionally, until lightly browned and very soft, about 20 minutes. Increase heat to high. Add chili powder, cumin, paprika, and cayenne pepper; cook, stirring, until fragrant, 1 minute. Add beer, vinegar, mustard, tomato pasta, Worcestershire sauce and honey; bring to a boil. Reduce heat to medium-low and simmer, uncovered, stirring occasionally, until the sauce is slightly thickened, 10 minutes. Add the beef, spooning sauce over it. Cover the pan and cook for at least four hours. Continue to cook until beef is tender or at desired texture. Remove the brisket. Pull the beef apart into long shreds using two forks.